Scentinel Nose Work Dog Training offers “Remote Training” to people that live in areas where they do not have access to CNWI/ANWI trainers and who want to continue to learn about K9 Nose Work Training … or who even want to start K9 Nose Work Training. Based on over twenty-five years as a detection dog trainer, Gail has developed a powerful K9 Nose Work Training Plan that has produced many successful competitive dogs. Please check out the Accolades Section of this website to see a listing of the many accomplishments of Gail’s students. Then, check out the Class Descriptions on this website to see the training progression which Gail developed over the ten years during which she has been offering K9 Nose Work classes. Through our “Remote Training,” Gail is able to share her K9 Nose Work Training Plan with individuals who are not in her area but who want to start their dogs in K9 Nose Work, or who are not satisfied with their dogs’ current foundational training. 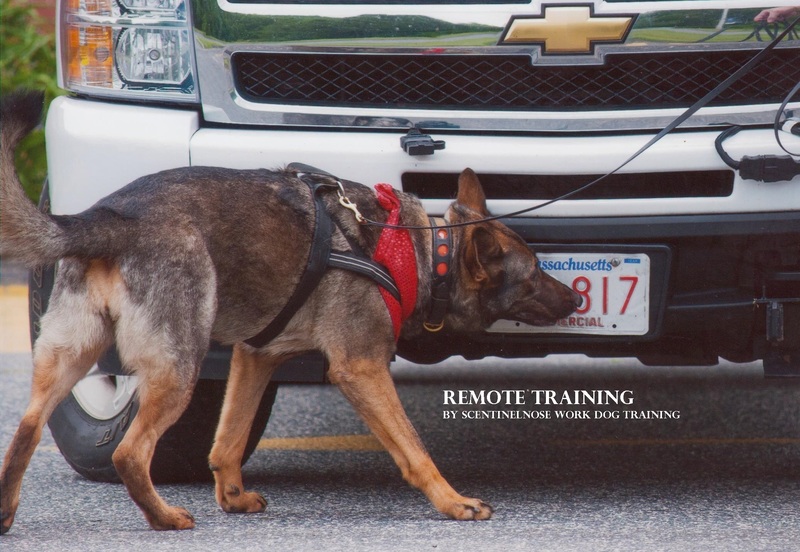 When you sign up for our “Remote Training” with a novice dog, or with a dog that you would like to “restart,” we will send to you one written lesson plan a week covering the first six weeks of Level 1 of our K9 Nose Work Training Plan. We then will ask you to send to us a short video of each week’s training which we will critique. We also have videos that we will share and discuss with you for all of the different venues which we introduce in Level 2 of our K9 Nose Work Training Plan. Then, when moving your dog on to “odor,” we have written lesson plans covering Levels 3 and 4 of our K9 Nose Work Training Plan where handlers are instructed how to introduce the three NACSW-target odors to their dogs. Handlers again are sent one lesson plan a week and are asked to send to us one video which we will critique. At the end of each of the four Levels, a student is getting much of the same information “remotely” as they would have gotten in class with Gail. Therefore, we charge our regular fee of $180 per six-week session as it is the “information you get each week” that is key, and not necessarily the number of runs we see you do. As Ron Gaunt, a Master Trainer and Co-Founder of the Sport of K9 Nose Work, used to say, “I do not train your dog. I train you to train your dog.” This form of Remote Training teaches you “how to train your dog.” The only thing folks do not get is the opportunity to develop an “eye,” but hopefully students ultimately get to watch other dogs train, so that works itself out. Scentinel Nose Work Dog Training offers “Remote Training” to handlers who are already doing search problems. When these handlers first sign up for our “Remote Training,” we ask them to videotape a search problem in each of the four NACSW elements and to send the videotapes to us for review. We then critique the performance of the dog and handler team, usually by phone. Based on the training goals of a handler, we describe various training “set ups” to help the dog team achieve, or to further, their training goals in any or all of four NACSW elements. 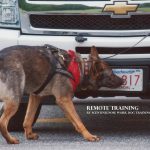 This form of “Remote Training” has proven to be very helpful to handlers who want to compete, as well as to dog owners who use this sport as an “enrichment activity” for themselves and for their dogs, as both types of handlers want to learn more about how to “set up” search problems appropriate for their dog’s level and to build a stronger working performance in their “already successful” working dog. However, we have found our “Remote Training” to be extremely helpful to handlers who compete their dogs but whose performance has somehow “gone south” or is simply not at the level desired by the handler. There is so much that goes into the training of a strong, working detection dog team and in the development of that trusting, reliable relationship which is so important to competing successfully. Unfortunately, a high level of performance is not “static” and can decline for many reasons. Maybe it is because a dog is struggling with working out the complexities of pooling odor. Maybe it is because a dog has lost its “focus” or “drive” for the work. Or, maybe it is because the handler is having difficulty “reading” their dog. Given the many years Gail has been training detection dogs, Gail has gained the experience, knowledge, and the “eye,” to help such dog teams and she is often able to give a handler information necessary to resolve these particular training problems as well as many others. While there are no “quick, easy fixes” when things break down, there are many dog teams competing successfully today who have benefitted from Gail’s “Remote” coaching and we look forward to sharing her knowledge with other dog teams in the future! For this type of Video Review and Phone Consultation (including a phone consultation with no video review in order to discuss a particular training problem or issue), we charge a set fee of $65 for thirty minutes. Please contact us at scentinelnosework@gmail.com if you would like to participate in this “Remote Training” or if you have any additional questions. We very much look forward to helping more people be successful in the wonderful sport of K9 Nose Work!! !